Jay and Johnny back when they seemed to enjoy one another. BURBANK, Calif. -- Early to bed -- 3 a.m. -- and early to rise -- 7:30 a.m. -- Jay Leno is in his smallish NBC office by 8:15 a.m. on most weekdays. The latter-day hardest-working man in show business is soon digesting the first batch of some 250 to 300 jokes submitted for his latest Tonight Show monologue. A new pageful arrives every five minutes during our midmorning interview. Twenty-some jokes will make the cut. His voice trails off, but don’t get the idea that Leno is a maniacal taskmaster. “If people aren’t willing to do that” basically refers to himself. At age 44, he is married without children and unswervingly single-minded about what it takes to keep hitting in the big leagues. Your “tunnel vision” must be 20/20. You can’t waste a minute of your time. In the end, David Letterman’s worst enemy may be Jay Leno’s sheer determination to be the last guy standing. 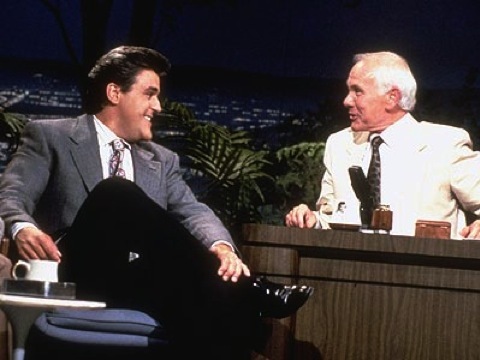 The Tonight Show, which Leno inherited from Johnny Carson on May 25, 1992, lately has been coming closer to getting the last laugh on CBS’ Late Show with David Letterman. The ratings gap between the two programs shrank to seven-tenths of a point during the February “sweeps.” In the May 1994 sweeps, Tonight trailed Late Show by 1.3 points. And in their first week of head-to-head competition -- Aug. 30-Sept. 3, 1993 -- Leno emerged a badly beaten four points behind Late Show. Tonight’s comeback is somewhat illusory. Leno’s ratings have remained in place while Letterman’s are slowly sliding south. NBC’s resurgence in prime-time this season lends a firm helping hand. Leno is being promoted during hot new shows such as ER and Friends. He also is much more comfortable on a new, intimate Tonight set that bears little resemblance to Johnny’s old digs. The makeover, on Sept. 27, coincided with NBC’s unexpectedly strong liftoff last fall. Meanwhile, CBS has dropped from first to third place in the prime-time ratings. Anyone who doesn’t know that hasn’t been watching Late Show of late. Many of Letterman’s monologues, even when he hosted on Oscar night, include a jab at his downtrodden employer. Early on, he didn’t blame them for tuning out Tonight. “The first year of our show we made some huge mistakes,” Leno says. “And I was just kind of standing around watching the world go by and thinking, ‘Well, all right, these people know what they’re doing.’ And that was not the case. He reacted by dumping his longtime friend, Helen Kushnick, who was producing the new Tonight. Her abrasiveness reportedly had split the show’s staff into warring camps. Tonight’s flailings and failings dovetailed with NBC’s indecisiveness on whether to replace Leno with the discontented Letterman, who had outgrown his Late Night program. NBC entertainment president Warren Littlefield, who championed Leno and prevailed, endured the slings and arrows of those who thought he was nuts. He is feeling much better these days. Debbie Vickers, who worked on Carson’s Tonight Show for 12 years, replaced Kushnick as producer in September 1992. She is not so much a show doctor as a holistic healer. 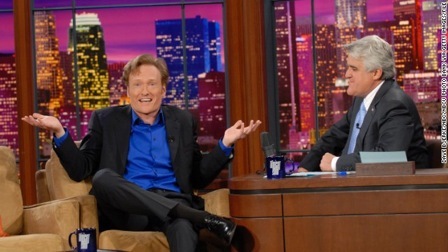 Leno and his first Tonight Show successor, Conan O’Brien. The ship’s captain is in his unvarying civilian uniform on this drizzly March morning. Tonight tapings usually begin at 5 p.m. Los Angeles time. Leno heads for home at about 7:30 p.m. Preparation for the next night’s show begins with a kitchen table joke-around that generally adjourns between 2 and 3 a.m. Mavis, his wife of 15 years, mostly comes into the picture on weekends and road trips. The public’s view of quintessential “show business life” -- wild parties, wilder spending -- is science fiction to Leno. Not that there aren’t temptations. Leno’s first Tonight appearance, as a guest on the March 2, 1977 show, came after years of failed attempts. It’s still as simple as that, he says. 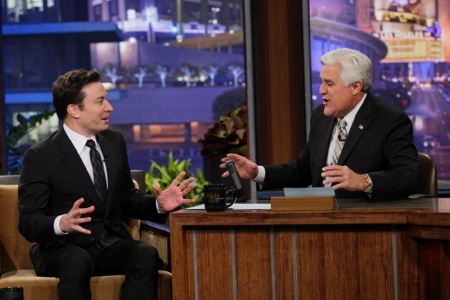 Leno and second Tonight Show successor, Jimmy Fallon. Leno in turns sells himself both off- and on-camera. Unlike Letterman or Carson, he gladly poses for pictures and signs autographs before and after Tonight tapings. While warming up the audience for the March 9 show, he even agreed to ask Paul Reiser to autograph a fan’s copy of his bestselling book, Couplehood. Mission accomplished during a commercial break. Win or lose the late-night wars, Leno says he’ll roll with the punches in the press or otherwise. At long last, it might be the other guy’s turn.